A widely acclaimed tenor saxophonist and vital cog to Jimmie Lunceford’s legendary swing band of the 1930’s and 1940’s who was a frequent soloist on his horn as well as taking lead vocals in a gruff voice who later moved into the outskirts of rock ‘n’ roll as a bandleader in an attempt to keep his career going after Lunceford’s death. Thomas was born in Pennsylvania in 1909 and grew up in a religious household where he was only allowed to play hymns on his horn. Nevertheless his musical skill was such that he joined a succession of name jazz bands, among them Horace Henderson, whose career paled beside his brother Fletcher Henderson, though it was Horace who later worked as an arranger for his sibling on some of his most renown material. An alto sax player during his time with Henderson he made the switch to tenor when he joined violinist Stuff Smith’s band. But it was upon his move to Lunceford’s acclaimed swing outfit in 1933 that Joe Thomas made his reputation. Though Lunceford’s musical approach was to emphasize the entire ensemble rather than feature elongated solos, Thomas made the most of his limited moments in the spotlights of songs and became known for packing a wallop in those brief spots. He also got occasional chances to sing during an era when vocalists were used for just quick refrains, as if merely another instrument to add variety to an arrangement. Lunceford’s band were among the originators of the entire swing movement and as such their popularity during Thomas’s dozen years with them was unmatched in black America and even vied with white imitators such as Benny Goodman who enjoyed far broader exposure. But upon the decline of the swing era in the mid-1940’s the band’s fortunes declined and when Lunceford died in the summer of 1947 due to poisoning, the likely victim of a racist act, Thomas, along with fellow saxophonist Eddie Wilcox, led the group as they attempted to carry on over the next year before the group broke up, unable to weather the loss of their popular leader and the shifting musical tastes of the era. Thomas landed at King Records in 1949, one of many name artists from an earlier period that the label signed with the hopes of branching them into the growing field of rock ‘n’ roll, as they’d done successfully with Ivory Joe Hunter and Wynonie Harris. While Thomas had the musical ability to perform rock credibly and seemed committed to giving it his all, his work largely fell on deaf ears . The one hit he saw during his run on King Records was actually a record by Todd Rhodes which was mistakenly attributed to Thomas on the label, though Thomas DID play sax on it. By the mid-1950’s Thomas retired from music and ran his family’s mortuary business for years before eventually coming out of retirement in the 1970’s and playing some dates in the style he’d first become known for. (However he was NOT the same musician known then as The Ebony Godfather who had a string of hits in the 1970’s in the jazz-funk realm). 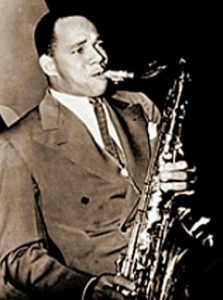 Joe Thomas passed away in 1986, having left an indelible mark in swing and a credible, though largely forgotten, showing in rock.